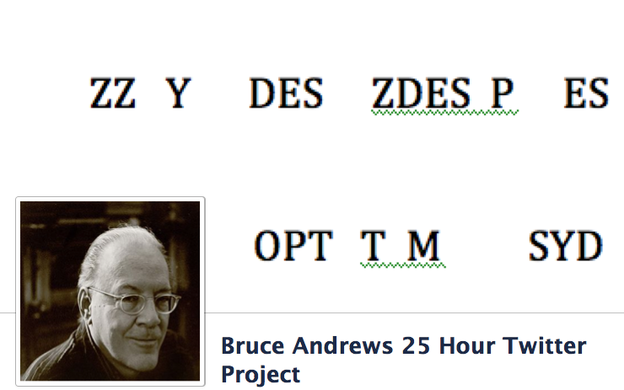 I'm pleased to pass along information about Bruce Andrews's 25-hour twitter project, April 1, 2014. On April 1st, 2014, Bruce Andrews and Maria Chavez will collaborate on a 25 hour performance piece on the social media platform, Twitter. After experiencing an intermedia performance of Bruce Andrews late last year, Maria sensed a striking affinity between Bruce's text/ language work and Twitter's interactive focus: short modular posts, limited to a handful of words, with a stress on vivid conciseness, wide open to immediate responses and links to a variety of media. The Bruce Andrews 25 hour piece is meant to use Twitter as sculptural documentation, becoming a real time archive of Bruce Andrews's current poetic writing and the responses it elicits in real time. Using a social media platform as an exhibition space, Maria Chavez will tweet a Bruce Andrews language text, every 5 minutes for 25 hours. That’s the 300 parts of a new poetic sequence, ‘Improper’, designed and edited for this occasion. Each twitter post will also have a link leading to a Soundcloud web page made specifically for the piece, with audio recordings of Andrews, performing each tweeted ‘poem’ individually. We're hoping for lots of interaction — retweets, liking and favoriting, parallel poetic comments, anecdotes, translations, mash-ups, sound files, photos, graphics, video: the internet sky's the limit. We are asking individuals and organizations in the arts and in the literary world to become sponsors — to commit to sharing and retweeting and reposting about the project. It’s an opportunity to reach a larger audience and network for interaction. Since the Twitter social media platform is free, your support as a sponsor requires only the ‘invisible’ currency that the Internet has created: better access to social media participation. This project wants to test out a new arrangement with artists and organizations working together, providing value and possibilities of interaction without cost. To become a sponsor, all you have to do is reply to this email address [mariadchavez@gmail.com] with the statement “I agree to the sponsorship terms and will participate in BRUCE ANDREWS 25 Hour Twitter Sculpture.” Make sure to include this letter in the body of the text. In the next few weeks, each sponsor will receive an email from Maria Chavez outlining #hashtags and links to past work. During this time, the goal is to sketch out some background and share some history of Bruce Andrews’s text and performance works. The project will require no more than 3 social media posts and/or tweets per sponsor, a week prior to the event. There are so many layers that can come into play when thinking about social media and its possible relationships to artists and organizations. With your participation, this project can help to push forward a new form of interacting and presenting when it comes to art and intermedia on the internet. We look forward to your working with us, and signing up to follow us now on Twitter & Facebook.